One company wants to make it happen. Plenty of classes have been rudely interrupted by students who are busy playing Fortnite: Battle Royale on their phones, but one course held around the country this summer will actually encourage the behavior. For the first time this year, teenagers around the country can take a summer course in video game design focused entirely on Fortnite: Battle Royale, leveraging interest in the game to help educate the next generation of engineers and game designers. The course comes from iD Tech Camps, a STEM-focused summer camp startup that’s grown over the last two decades to educate 60,000 students a year. Programs focus on everything from coding to design, robotics, and of course, video game development. Though past courses have occasionally focused on other games like Minecraft, the brand-new “Fortnite Camp and Unreal Engine Level Design” this summer is one of a kind, and it will show kids around the country how to build a game just like Fortnite using the same software used by Epic Games. 'Fortnite' might have the best battle royale right now, but what if someone made one that was even better? 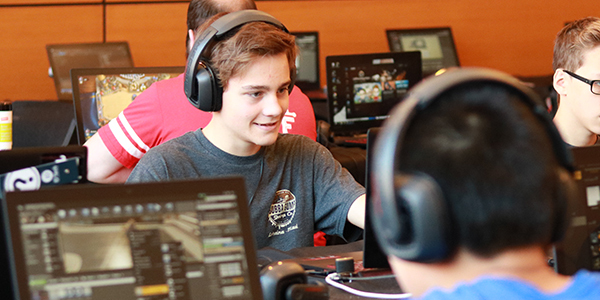 Ricky Bennett, Director of Innovation and Partnerships at iD Tech Camps, tells Inverse all about how iD Tech Camps developed the course in partnership with Epic Games to craft an experience that students will love. “We’re gonna play some Fortnite and have fun in the course,” he said. The course will be taught in 28 states and Washington DC throughout this summer to students 13 and older. (Fortnite sometimes caters to an even younger audience, but the game is still technically a violent shooter — albeit a cartoonish one — and therefore carries with it a “Teen” rating.) With an average class size of eight students to one teacher, each class works together to build what’s essentially “condensed version of Fortnite,” according to Bennett. They’ll use assets directly from Epic Games’s Paragon to build their own battle royale environment in Unreal Engine. The default skin for "TwinBlast," a character from 'Paragon' that anybody can use when working in Unreal Engine. One way iD Tech Camps is trying to get students even more excited is by securing the endorsement of Richard “Tyler” Blevins, more commonly known as the Fortnite streaming sensation “Ninja.” In early April, iD Tech Camps hosted a “Fortnite Nite” in Chicago with Ninja as a special guest to give potential students a taste of what to expect from the course. The earliest sessions for iD Tech Camps’ Fortnite course start in only a few more weeks, so it’s only a matter of time before plenty of teenagers around the country are making their own battle royale games. Who knows, maybe one could be the next big thing?